Tromsø (Norwegian pronunciation: [²trʊmsœ] ( listen); Northern Sami: Romsa; Finnish: Tromssa; Kven: Tromssa) is a municipality in Troms county, Norway. The administrative centre of the municipality is the city of Tromsø. Outside Norway, Tromso and Tromsö are alternative spellings of the name. Tromsø lies in Northern Norway. The 2,521-square-kilometre (973 sq mi) municipality is the 18th largest by area out of the 422 municipalities in Norway. Tromsø is the 9th most populous municipality in Norway with a population of 75,638. The municipality's population density is 30.6 inhabitants per square kilometre (79/sq mi) and its population has increased by 15.9% over the last decade. It is the largest urban area in Northern Norway and the third largest north of the Arctic Circle anywhere in the world (following Murmansk and Norilsk). Most of Tromsø, including the city centre, is located on the island of Tromsøya, 350 kilometres (217 mi) north of the Arctic Circle. In 2017, the city of Tromsø had a population of about 65,000 people spread out over Tromsøya and parts of Kvaløya and the mainland. Tromsøya is connected to the mainland by the Tromsø Bridge and the Tromsøysund Tunnel, and to the island of Kvaløya by the Sandnessund Bridge. The municipality is warmer than most other places located on the same latitude, due to the warming effect of the Gulf Stream. Tromsø is even milder than places much farther south of it elsewhere in the world, such as on the Hudson Bay and in Far East Russia, with the warm-water current allowing for both relatively mild winters and tree growth in spite of its very high latitude. The city centre of Tromsø contains the highest number of old wooden houses in Northern Norway, the oldest house dating from 1789. The city is a cultural centre for its region, with several festivals taking place in the summer. Torbjørn Brundtland and Svein Berge of the electronica duo Röyksopp and Lene Marlin grew up and started their careers in Tromsø. Noted electronic musician Geir Jenssen also hails from Tromsø. The city of Tromsø is named after the island of Tromsøya, on which it stands. The last element of the city's name comes from 'island' (Norwegian: øy, Danish: ø), but the etymology of the first element is uncertain. Several theories exist. One theory holds "Troms-" to derive from the old (uncompounded) name of the island (Old Norse: Trums). Several islands and rivers in Norway have the name Tromsa, and the names of these are probably derived from the word straumr which means "(strong) current". (The original form must then have been Strums, for the missing s see Indo-European s-mobile.) Another theory holds that Tromsøya was originally called Lille Tromsøya (Little Tromsøya), because of its proximity to the much bigger island today called Kvaløya, that according to this theory was earlier called "Store Tromsøya" due to a characteristic mountain known as Tromma (the Drum). The mountain's name in Sámi, Rumbbučohkka, is identical in meaning, and it is said to have been a sacred mountain for the Sámi in pre-Christian times. The Sámi name of the island, Romsa, is assumed to be a loan from Norse - but according to the phonetical rules of the Sami language the frontal t has disappeared from the name. However, an alternative form - Tromsa - is in informal use. 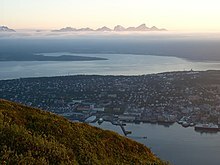 There is a theory that holds the Norwegian name of Tromsø derives from the Sámi name, though this theory lacks an explanation for the meaning of Romsa. A common misunderstanding is that Tromsø's Sámi name is Romssa with a double "s". This, however, is the accusative and genitive form of the noun used when, for example, writing "Tromsø Municipality" (Romssa Suohkan). In Finnish, however, the word is written with a double "s": Tromssa. The area's rich Norse and Sámi heritage is well documented. The Norse chieftain Ohthere, who lived during the 890s, is assumed to have inhabited the southernmost reaches of today's Tromsø municipality. He described himself as living "furthest to the North of all Norwegians" with areas north of this being populated by Sámi. An Icelandic source (Rimbegla) from the 12th century also describes the fjord Malangen in the south of today's Tromsø municipality as a border between Norse and Sámi coastal settlements during that part of the Middle Ages. There has also been extensive Sámi settlement on the coast south of this 'border' as well as scattered Norse settlements north of Malangen—for example, both Sámi and Norse Iron Age (0–1050 AD) remains have been found on southern Kvaløya. The first church on the island of Tromsøya was erected in 1252. Ecclesia Sanctae Mariae de Trums juxta paganos ("The Church of Saint Mary in Troms near the Heathens"—the nominal "heathens" being the Sámi), was built during the reign of King Hákon Hákonarson. At the time, it was the northernmost church in the world. Around the same time a turf rampart was built to protect the area against raids from Karelia and Russia. During the 17th century, while Denmark–Norway was solidifying its claim to the northern coast of Scandinavia and during this period a redoubt, Skansen, was built. Despite only being home to around 80 people, Tromsø was issued its city charter in 1794 by King Christian VII. This coincided with, and was a direct consequence of, the abolition of the city of Bergen's centuries-old monopoly on the trade in cod. Tromsø quickly rose in importance. The Diocese of Hålogaland was created in 1804, with the first bishop being Mathias Bonsak Krogh. The city was established as a municipality 1 January 1838 (see formannskapsdistrikt). Arctic hunting, from Novaya Zemlya to Canada, started up around 1820. By 1850, Tromsø was the major centre of Arctic hunting, overtaking the former centre of Hammerfest, and the city was trading from Arkhangelsk to Bordeaux. When Germany invaded Norway in 1940, Tromsø served briefly as the seat of the Norwegian government. General Carl Gustav Fleischer arrived in Tromsø on 10 April 1940 after flying in terrible conditions. From Tromsø he issued orders for total civilian and military mobilisation and declared Northern Norway a theatre of war. Fleischer's strategic plan was to first wipe out the German forces at Narvik and then transfer his division to Nordland to meet a German advance from Trøndelag. The Germans eventually captured all of Norway, after allied support had been withdrawn, although they encountered fierce resistance from the Finnmark-based Alta Battalion at Narvik. 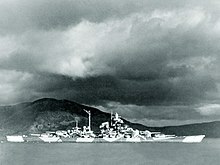 Tromsø escaped the war unscathed, although the German battleship Tirpitz was sunk by RAF Avro Lancaster bombers during Operation Catechism off the Tromsøy island on 12 November 1944, killing close to 1,000 German sailors. At the end of the war, the city received thousands of refugees from Finnmark county and the North Troms area - which had been devastated by German forces using scorched earth tactics in expectation of the Red Army offensive. The city of Tromsø was established as an independent municipality on 1 January 1838 (see formannskapsdistrikt). The city was completely surrounded by the Tromsøe landdistrikt (the rural municipality of Tromsø / later renamed Tromsøysund), but they were governed separately. As the city grew in size, areas were added to the city from the rural district. 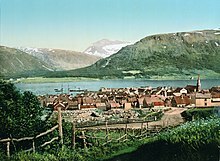 On 1 January 1861, an area of Tromsøysund (population: 110) was transferred to the city of Tromsø. On 1 January 1873, an unpopulated area of Tromsøysund was transferred to the city. On 1 July 1915, another area of Tromsøysund (population: 512) was merged into the city of Tromsø. On 1 January 1955, the Bjerkaker area on Tromsøya (population: 1,583) was transferred from Tromsøysund to the city of Tromsø. During the 1960s, there were many municipal mergers across Norway due to the work of the Schei Committee. On 1 January 1964, the city of Tromsø (population: 12,602), the municipality of Tromsøysund (population: 16,727), most of the municipality of Ullsfjord except for the Svendsby area (population: 2,019), and most of the municipality of Hillesøy except for the parts on the island of Senja (population: 1,316) were all merged to form a new, larger Tromsø Municipality. 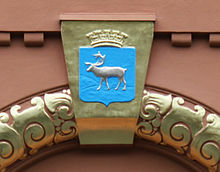 The coat of arms of Tromsø was devised in 1870 and is blazoned "Azure, a reindeer trippant Argent." It is often surmounted by a mural crown with five or four turrets. The municipal authority currently uses a stylised rendering drawn by Hallvard Trætteberg (1898–1987) and adopted by royal resolution on 24 September 1941. Tromsø is the eighth-largest municipality in Norway with a population of 71,590, and the centre of the ninth-largest urban area, with a population of about 65,000. The city is home to the world's northernmost university and also houses the northernmost botanical garden and planetarium. The city centre is located on the east side of the Tromsøya island — over 300 kilometres (190 mi) north of the Arctic Circle at 69°40′33″N 18°55′10″E﻿ / ﻿69.67583°N 18.91944°E﻿ / 69.67583; 18.91944. Suburban areas include Kroken, Tromsdalen (on the mainland, east of Tromsøya), the rest of the Tromsøya island, and the eastern part of the large Kvaløya, west of the Tromsøya island. The Tromsø Bridge and Tromsøysund Tunnel both cross the Tromsøysundet strait connecting the mainland with Tromsøya by road. On the western side of the city, the Sandnessund Bridge connects Tromsøya island with Kvaløya island. There are many tall mountains within the municipality including Hamperokken, Jiehkkevárri, Store Blåmann, Store Fornestinden, and Tromsdalstinden. The Lyngen Alps mountain range lies along the Tromsø-Lyngen municipal border. There are many islands within the municipality of Tromsø including Hillesøya, Kvaløya, Rebbenesøya, Ringvassøya, Sommarøya, and Tromsøya. There are also several fjords that are located in Tromsø including the Balsfjorden, Kaldfjorden, Malangen, and Ullsfjorden. Panoramic view of Tromsø from Fløya. The Tromsø Bridge and the Arctic Cathedral can be seen in the lower-right corner. Tromsø during polar night from Fjellheisen. Tromsø experiences a subarctic climate (Köppen climate classification Dfc) as winter temperatures are just cold enough to qualify and the summer season is short. However, precipitation amount and pattern, with maximum precipitation in autumn and early winter, as well as lack of permafrost, are atypical for subarctic areas. Due to the ice-free Norwegian Sea and the westerlies bringing the mild air ashore, winter temperatures in Tromsø are moderated and extremely mild for the latitude. Tromsø has reputation of accumulating a lot of snow in winter, but on the streets of the city ice often prevails, especially in the first half of the winter. Tromsø's snowfall pattern is quite erratic and varies substantially between different winters. Thaws with rain in the polar night mid-winter are not uncommon, which melts or wets existing snow, often followed by chilly windy Arctic blasts, creating dangerous ice driving and walking conditions. It is common to see Tromsø inhabitants walking with spikes in their shoes and almost all cars use studded tires. The all-time record for snow depth was set on 29 April 1997, when the meteorological station on top of Tromsøya recorded 240 centimetres (94.5 in) of snow on the ground. In an average winter, Tromsø sees 160 days with at least 25 centimetres (10 in) of snow on the ground (based on 1970–2000 average and recorded at the meteorological office station on top of the island, 100 meters above sea level). The lowest temperature ever recorded is −18.4 °C (−1.1 °F) in February 1966,. However, at the airport, also in the city, the lowest ever recording is −20.1 °C (−4.2 °F) in February 1985. Despite being a full 10 degrees further north than the Norwegian capital, Oslo, winter temperatures are very similar. The "midnight sun" is above the horizon from 19 May to 27 July (71 days), and the period with continuous night lasts a bit shorter, polar night from 28 November to 14 January (48 days). Summers are rather cool, sometimes cloudy and rainy, and sometimes sunny, often with large variations from year to year and from month to month, depending on the weather pattern. However, for its latitude its summers are fairly warm, especially for a maritime location. Tromsø has recorded the sunniest month ever in Norway with 430 sunhours in July 1980, and also the sunniest spring month with 381 sunhours in May 2013. The highest temperature ever recorded at the met office 100 m amsl is 30.2 °C (86.4 °F) in July 1972. Outside the city, large areas in the municipality are above the treeline and have an alpine tundra climate. On the west coast of Kvaløya (Sommarøy), climate data show a mean annual temperature of 3.9 °C (39.0 °F), mostly because winters here are 2 °C (4 °F) warmer compared to the city, making this part of the municipality a subpolar oceanic climate (Cfc) zone. Tromsø has the distinction of being the northernmost city on earth where the average yearly low is above freezing. Recent years have seen warming, and there have been no overnight air frost in June since 1997. The Northern Lights near Tromsø. Early afternoon during the polar night in Tromsø, Norway. Tromsø in midnight sun in July. Tromsø Airport on midday in early January. 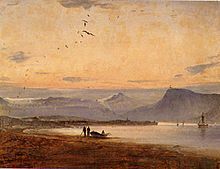 19th Century view of Tromsø by Peder Balke. The midnight sun occurs from about 18 May to 26 July, but the mountains in the north block the view of it for a few days, meaning that one can see the midnight sun from about 21 May to 21 July. Owing to Tromsø's high latitude, twilight is long, meaning there is no real darkness between late April and mid-August. The sun remains below the horizon during the polar night from about 26 November to 15 January, but owing to the mountains, the sun is not visible from 21 November to 21 January. The return of the sun is an occasion for celebration. However, because of the twilight, there is some daylight for a couple of hours even around midwinter, often with bluish light. The nights shorten quickly. By 21 February the sun is above the horizon from 7:45 am to 4:10 pm, and by 1 April it is above the horizon from 5:50 am to 7:50 pm (daylight saving time). If we include astronomical twilight as "not night", then Tromsø only has 14 hours of night on the winter solstice. It is possible to observe aurora borealis (northern lights) from Tromsø, as northern Norway is located in the auroral zone. As it is always light in the summer, no aurora is visible between late April and mid August. Additionally, due to the coastal location, Tromsø is often subject to cloudy conditions which prevents aurora being seen, even if they are present. The compact city centre has the biggest concentration of historic wooden houses north of Trondheim, and they co-exist with modern architecture. The houses date from 1789 to 1904, when building wooden houses was banned in the city centre, as in several other Norwegian cities. The oldest house in Tromsø is Skansen, built in 1789 on the remains of a 13th-century turf rampart. The Polar Museum, Polarmuseet, situated in a wharf house from 1837, presents Tromsø's past as a centre for Arctic hunting and starting point for Arctic expeditions. Tromsø Cathedral, Norway's only wooden cathedral, built in 1861, is located in the middle of the city, and so is the small Catholic church Vår Frue ("Our Lady"). Northern Europe's oldest cinema still in use, Verdensteatret, was built in 1915–16. The cinema has large wall paintings, made by the local artist Sverre Mack in 1921, which picture scenes from Norwegian folk lore and fairy tales. The Arctic Cathedral, a modern church built in 1965, is situated on the mainland, facing the sound and city centre. The church, in reality a parish church and not a cathedral, was drawn by Jan Inge Hovig. The Polaria aquarium and experience centre from 1998 is a short walk south from the city centre. The Tromsø Museum is a university museum, presenting culture and nature of North Norway. The museum also displays the Arctic-alpine botanic garden, the world's northernmost botanical garden. A cable car goes up to mount Storsteinen, 420 metres (1,380 feet) above sea level, with a panoramic view over Tromsø. The mountain Tromsdalstinden, 1,238 metres (4,062 ft), on the mainland, which is easily spotted from the city centre, is also a major landmark. At the top of Tromsøya is a lake called Prestvannet. The Church of Norway has eight parishes (sokn) within the municipality of Tromsø. It is part of the Tromsø domprosti (arch-deanery) in the Diocese of Nord-Hålogaland. All municipalities in Norway, including Tromsø, are responsible for primary education (through 10th grade), outpatient health services, senior citizen services, unemployment and other social services, zoning, economic development, and municipal roads. The municipality is governed by a municipal council of elected representatives, which in turn elect a mayor. The municipality falls under the Nord-Troms District Court and the Hålogaland Court of Appeal. The mayor of Tromsø since 2015 has been Kristin Røymo of the Labour Party. Ullsfjord were merged with Tromsø 1 January 1964. More than 100 nationalities are represented in the population. Among the more prominent minorities are the Sami, Russians, and Finns, both the local Kvens (descendants of 19th century Finnish immigrants) and recent immigrants from Finland proper. The world's northernmost mosque is to be found in Tromsø. Our Lady Catholic church is the seat of the world's northernmost Catholic Bishop, who leads the Territorial Prelature of Tromsø. Although the local Catholic population is only 350 strong, Pope John Paul II visited this small church and stayed as a guest of the bishop in 1989. As noted in the history section, the Tromsø area has long been a home to Sámi culture. The assimilation of the Coastal Sámi, however, led to the local Sámi culture becoming increasingly invisible in the Tromsø area during the 20th century. The 1970s, however, saw a revitalization of Sámi culture and identity, which also made itself felt in Tromsø. Today there is a Sami kindergarten and Sami language classes in certain schools of Tromsø. There have been attempts at countering the decline of the Sámi language for example through the establishment of a Sami language centre in Ullsfjord. Tromsø city has generally displayed a positive attitude to the indigenous minority culture, for example through municipally arranged celebrations of the Sámi People's Day, bilingual signs at the University, and when the city made its bid for the Winter Olympics the Sámi name of Tromsø, Romsa, was included in the would-be logo of the event - which also incorporated an old Sámi symbol as its main element. In 2011, however, the role of Sámi culture in Tromsø became controversial. The Municipal Board had applied for Tromsø to join the Sámi Language Administrative Area. This would have entailed giving equal space to selected Sámi toponyms on signposts, allowing Sámi-speakers to communicate in their language with local authorities, and make means available from the Sámi Parliament for officials to learn Sámi. The political parties FrP, Venstre and Høyre, opposed the decision and made it a part of their election campaign to reverse it, claiming that Tromsø was "a Norwegian city" and hence it was natural neither to display Sámi toponyms along with Norwegian ones, nor make Sámi an official language along with Norwegian. The parties opposing a larger role for Sámi culture in Tromsø won the election and reversed the application. It has been claimed that the issue has "divided" Tromsø's inhabitants between those who see Sámi culture as naturally belonging there and those who see it as alien to the area. During and after the election campaign, pro-Sámi politicians received threats and people wearing traditional Sámi garb claim to have been subjected to verbal abuse. In June 2013 the municipality nonetheless entered into a cooperation agreement with the Sámi Parliament which is intended to strengthen Sami language education and Sami culture in Tromsø. Ølhallen, one of the many clubs, pubs and bars in Tromsø. Being the largest city in Northern Norway, Tromsø is a cultural centre for its region. It gained some international attention when on 11 June 2005 hosted one of six 46664 concerts, designed to put work concerning HIV/AIDS on the international agenda. Many cultural activities take place in Kulturhuset (English: lit. the culture house), including concerts by Tromsø Symphony Orchestra and plays by Tromsø's professional theatre troupe, Hålogaland Teater. The new theatre building was opened in November 2005. The city contains several museums. The largest are the Northern Norwegian Art Gallery (Nordnorsk Kunstmuseum) and the Tromsø Gallery of Contemporary Art (Tromsø Kunstforening). The Tromsø techno scene is the origin of many of Norway's most important artists in electronic music, and Tromsø was a leading city at the early stages of the house and techno scene in Norway from the last part of the 1980s. The internationally recognized duo Röyksopp and the ambient electronic musician Geir Jennsen, known as Biosphere, are the most famous exports. The record label Beatservice Records and the Insomnia Festival means Tromsø still leads the country in the development and promotion of the genre. The local newspapers are Bladet Tromsø and Nordlys. Both the Tromsø International Film Festival and Nordlysfestivalen (lit. the Aurora Borealis Festival), a classical music festival, are arranged in January. The end of that month is marked by the Day of the Sun (Soldagen), when the sun finally appears above the horizon after the Polar Night, which is celebrated, mainly by children. The International Day of the Sami People is celebrated at the University of Tromsø and the city hall on 6 February every year. Tromsø's Latin American Festival, No Siesta Fiesta, is held at the end of February. It started in 2007 and showcases "the best of Latin America" in Northern Norway with film, dance, music, art, seminars, debates, markets, and a street Samba parade. Every autumn the Insomnia Festival for electronic music is hosted. It is one of the largest and most important festivals for electronic music and techno culture in Norway. The Bukta Tromsø Open Air Festival, held in June and July, is a popular music festival. The Bukta festival is mainly a rock festival, but also features other kinds of modern music. The festival takes place in Telegrafbukta, a park on the south-western part of the Tromsøya island. Other popular cultural summer events among the population of Tromsø is the Karlsøy festival and the Riddu Riddu festival, both held in the region surrounding the city. Tromsø is the home of many football clubs, of which the three most prominent are Tromsø IL, which plays in the Norwegian Premier League and is the world's northernmost Premier League football team, I.F. Fløya in the Norwegian First Division (women), and Tromsdalen U.I.L., playing in the Adeccoliga. Tromsø Midnight Sun Marathon is arranged every year in June and recently also a Polar Night Halfmarathon in January. The city is home to many clubs in the top division in various sports. Most notably basketball-outfit Tromsø Storm in the BLNO, BK Tromsø in the top volleyball league for men, and Tromsø Volley in the top volleyball league for women. The oldest sports club in Tromsø is Tromsø Turnforening, a gymnastics club founded in 1862, that also was the cradle of the before mentioned football club Tromsø IL. Tromsø was selected by the Norwegian National Olympic Committee as Norway's candidate for the 2018 Winter Olympics. This would have made Tromsø the first city north of the Arctic Circle to host the games. There were plans to use ships as the media village. In October 2008 the NOC suspended Tromsø's bid, citing excessive costs. From the southern to the northern tip of the island Tromsøya, there is a floodlit cross country ski track. A ski jump is also situated on the island, close to the university. As of the spring in 2010, the city's first ice rink has been open and is home to Tromsø Hockey, which plays in the Swedish Ice Hockey Association's League 3. ^ Erroneously, the Sámi name is often believed to be "Romssa". This is because "Tromsø Municipality" is "Romssa Suohkan". Romssa, however is the genitive case, so that "Romssa Suohkan" translates to "the Municipality of Romsa". ^ "Unike steinalderfunn" (in Norwegian Bokmål). nrk.no. 2011-07-27. Retrieved 2013-08-21. ^ "British Museum - Collection online - Search: Tromso". British Museum. Retrieved 9 June 2014. ^ "Ottar fortalte om det ukjente "Norge" - Magasinet". Dagbladet.no. 2009-08-18. Retrieved 2012-02-16. ^ a b "2 Samisk tilstedeværelse..." regjeringen.no. Retrieved 2012-02-16. ^ "Sør-Kvaløya - fornminner — Kulturminneaaret 2009" (in Norwegian). Loype.kulturminneaaret2009.no. Archived from the original on 1 May 2012. Retrieved 2012-02-16. ^ "Diplomatarium Norvegicum b.1 nr.112, the Papal letter (in Latin) first referring to Troms". Dokpro.uio.no. Retrieved 2012-11-22. ^ "Biskoper i Hålogaland bispedømme 1804-1952". Den Norske Kirke. Archived from the original on 9 October 2007. Retrieved 3 November 2011. ^ Statsarkivet i Tromsø 1992: Arkivkatalog TROMSØ OFFENTLIGE LÆRERSKOLE, page 6. ^ "Om museet" (in Norwegian). Universitet i Tromsø. Archived from the original on 3 November 2007. Retrieved 2007-11-03. ^ "Fra ølvogn til mikrobryggeri". Macks Ølbryggeri AS. Retrieved 2007-11-03. ^ "Destinasjon Tromsø - Facts about Tromsø". Destinasjontromso.no. Archived from the original on 9 October 2011. Retrieved 2012-11-22. ^ "Lost heroes of the 'Tirpitz'". BBC History. BBC. 17 February 2011. Retrieved 21 August 2018. ^ "World War II Database". World War II Database. Retrieved 21 August 2018. ^ Derry, T.K. (1972). A History of Modern Norway: 1814—1972. Clarendon Press, Oxford. ISBN 0-19-822503-2. ^ "1902 Tromsø. Population 1 January and population changes during the year. 1951-". Statistics Norway. 2007. Retrieved 2007-11-03. ^ Statistics Norway (1 January 2011). "Urban settlements. Population and area, by municipality". Archived from the original on 25 November 2011. ^ a b c Jukvam, Dag (1999). "Historisk oversikt over endringer i kommune- og fylkesinndelingen" (PDF) (in Norwegian). Statistisk sentralbyrå. ^ "TROMSØ". Arkivverket.no. 1941-09-24. Retrieved 2010-06-24. ^ Slavomir.P. "Coats-of-arms - National Archival services of Norway". Riksarkivet.no. Archived from the original on 2012-02-27. Retrieved 2012-11-22. ^ "Civic heraldry of Norway - Norske Kommunevåpen". Heraldry of the World. Retrieved 2018-08-14. ^ "Botanisk hage i Tromsø" [Botanical Garden in Tromsø]. The Arctic University of Norway. Retrieved 2017-02-25. ^ "Bli rik på grønn jul", "Våt jul i snøbyen!" ^ "Tromsø (Troms)". met.no. Retrieved 2017-02-25. ^ "Coldest temperature in February". Yr.no. Retrieved 22 November 2012. ^ "Tromsø official climate statistics". Retro.met.no. 28 January 2008. Archived from the original on 2012-07-17. Retrieved 22 November 2012. ^ "Climate Statistics for Tromsø, Norway (1961-1990)". November 2011. ^ "Tromsø (Troms)". June 2013. ^ "Moyennes 1981-2010 Norvége" (in French). Retrieved 11 January 2017. ^ "Tromsø er "djevelsk stygg" - VG Nett om Reiselivsnyheter" (in Norwegian). Vg.no. 2008-08-21. Retrieved 2010-05-29. ^ Carina Hansen. "Forfall i hele byen - iTromsø" (in Norwegian). Itromso.no. Retrieved 2010-05-29. ^ Hansen, Tore, ed. (2016-05-12). "kommunestyre". Store norske leksikon (in Norwegian). Kunnskapsforlaget. Retrieved 2018-08-07. ^ "Befolkningen i Tromsø kommune etter statsborgerskap 1.1. 2005 og 1.1. 2006" [Population of the municipality of Tromsø by nationality from 1 January 2005 to 1 January 2006]. InterInfo Tromsø municipality (in Norwegian). 2006. Archived from the original on 30 October 2007. Retrieved 6 July 2007. ^ "Broen 2004 no.3". Broen. Norwegian Catholic Church. 2004. Retrieved 6 July 2007 – via issuu. ^ "09817: Immigrants and Norwegian-born to immigrant parents, by immigration category, country background and percentages of the population 2010 - 2018". Statistics Norway. ^ Informasjonstjenesten (2 February 2006). "Samefolkets dag i Tromsø" [Sámi People's Day in Tromsø]. Tromsø Kommune (in Norwegian). Archived from the original on 14 May 2012. Retrieved 2012-02-16. ^ "Tromsø 2018 (2006-2008) - i-Tromsø". Itromso.canalblog.com. Retrieved 2012-02-16. ^ "Nå blir Tromsø samisk område". Politisk.tv2.no. 16 June 2011. Archived from the original on 5 April 2012. Retrieved 2012-02-16. ^ "Vrenger kofta i protest mot same-snuoperasjon | TV 2 Play". Tv2.no. 2011-11-05. Archived from the original on 6 November 2011. Retrieved 2012-02-16. ^ "Vrenger kofta i protest mot samisk-nei - TV 2 Nyhetene". Tv2.no. Retrieved 2012-02-16. ^ Fjellheim, Skjalg (2011-02-09). "Tromsø er ingen sameby - NRK". NRK. Archived from the original on 9 May 2012. Retrieved 2012-02-16. ^ "Lar seg ikke knekke - NRK Sápmi - NRK". Nrk.no. 2011-11-17. Retrieved 2012-02-16. ^ "20 år med techno". Aftenposten. 26 November 2004. Archived from the original on 29 June 2011. Retrieved 6 July 2007. ^ "Vennskapsbyer" (official website). Tromsø, Norway: Tromsø municipality. Archived from the original on 2012-08-14. Retrieved 2014-12-01. ^ "Intercity and International Cooperation of the City of Zagreb". © 2006-2009 City of Zagreb. Retrieved 2009-06-23. Wikimedia Commons has media related to Tromsø. Wikisource has the text of the 1911 Encyclopædia Britannica article Tromsö.